Cobham Community Pre-School, an 'Outstanding' early years provider (Ofsted 2015), has been serving local families and inspiring children for over 30years from our home in the village of Cobham in Kent. We provide quality care and education for children from the age of 2½years until starting school. We run a wide variety of actitivies for our children, five days a week during term time. 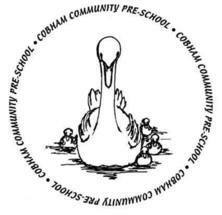 "Exceptional staff who care about the children"
"Facilities and equipment are fabulous"
"Excellent preparation for primary school"
Thank you for visiting the Cobham Community Pre-School website. If you have any feedback about the website please contact us.